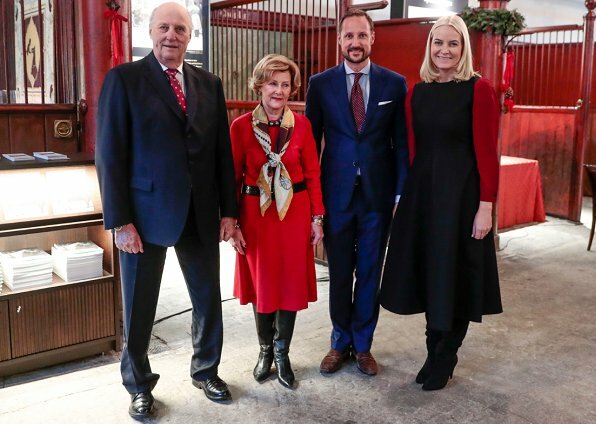 Yesterday, King Harald and Queen Sonja of Norway invited guests who are connected to the Church City Mission, the Salvation Army, the Blue Cross and =Oslo to a Christmas gathering in the Queen Sonja Art Stable today. A dinner was given and a children choir made a performance at the gathering. 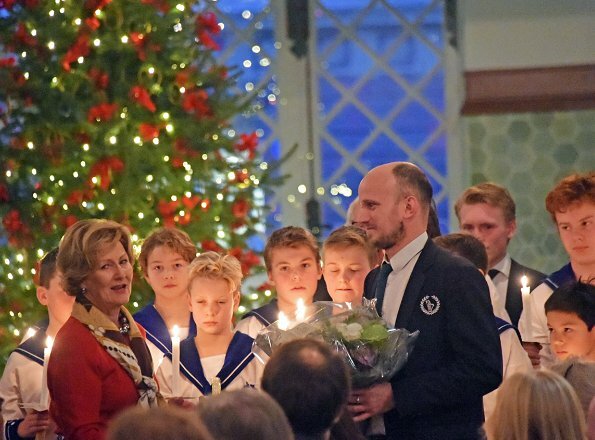 Crown Prince Haakon and Crown Princess Mette-Marit also attended that gathering. 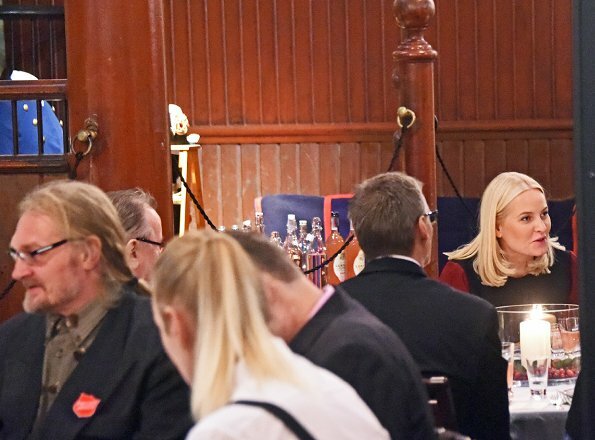 I don´t think that Mette-Marit looks good. That black thing is monstrous, it´s too long, too wide. And it´s just a wall of black together with the boots. The red sleeves are a nice touch, but they look so detached from the rest of the outfit. She could have easily tied them in better by adding another red accessory (belt, brooch or christmas style ornament). I must say that I´m equally disappointed by Haakon´s look. That blue suit has to go. He constantly wears that suit, and it´s too tight, it´s boring, the brown shoes are scruffy and his tie-binding skills are lacking. Sonja on the other hand looks great. That lady has more taste than the rest of the family combined. I agree too. There was a time when Mette-Marit use to look good in her choice of clothes but over the past year or more she seems not to care. I wonder why?? Haakon also looks like he only has one suit and pair of shoes to wear. I don't understand what these two are thinking. On the other hand Queen Sonja always looks wonderfully groomed and quite chic also. A lovely looking woman.Mette-Marit needs to up her game.